Introduction: Complicated crown-root fractures are rare and their treatment is complex. Numerous methods such as crown lengthening and orthodontic or surgical extrusion have been described for the treatment of crown-root fracture. The aim of this study was to report managing complicated crown-root fracture using intentional replantation with 180° rotation. Case report: This case report demonstrates successful management of complicated crown-root fracture in central incisor of a 10-year-old boy using intentional replantation with 180° rotation. Discussion: At 18-month follow-up, the replanted tooth revealed normal function with no obvious resorption. Complicated crown-root fracture is a rare injury in which the fracture line originates in the crown portion and extends apically into the root in an oblique direction. Most common etiologic factors are injuries caused by falls, bicycle and automobile accidents, and foreign bodies striking the teeth. Forceps eruption or intentional replantation has several advantages. It takes less time and enables more precise identification of the fracture line. In this procedure, after tooth extraction, tooth replants in a more coronal position to facilitate its restoration. In case of palatally inclined fracture, 180° rotation can often imply that only slight extrusion is necessary to accommodate crown restoration due to difference in position of the cementoenamel junction labially and palatally. This article presents a case of successful management of complicated crown-root fracture by intentional replantation with 180° rotation. A 10-year-old boy was referred to Isfahan Dental School, Department of Pediatric Dentistry because of crown-root fracture of maxillary left central incisor. Informed consent was obtained before any procedure. The injury was caused by a bicycle accident 1 month earlier. The patient had no medical history and periodontal status was normal. 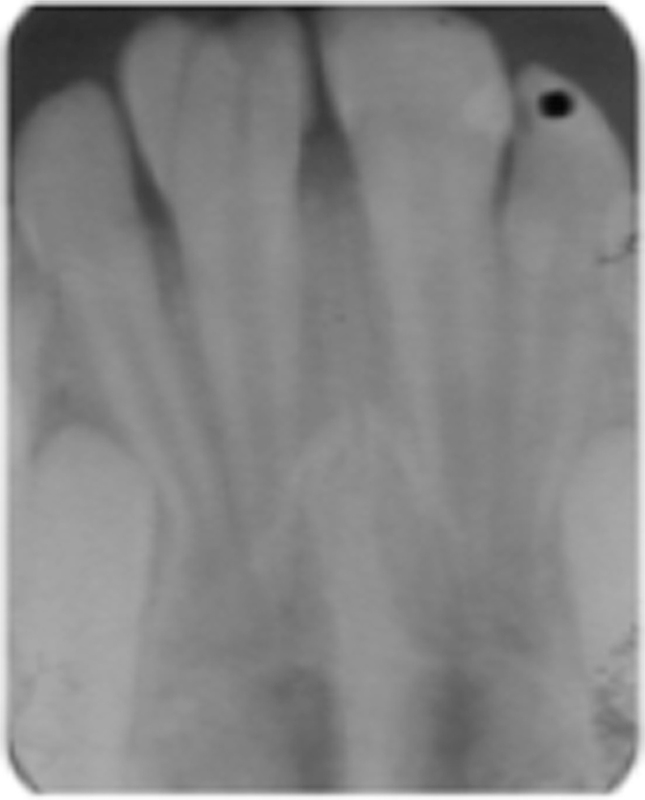 Clinical and radiographic examination revealed complicated crown-root fracture [Figure 1]. Thermal and Electrical Pulp Tester (EPT) (Analytic Technology Pulp Tester®, Redmond, WA, USA) tests indicated that the tooth was vital. After administration of local anesthesia (2% lidocaine with 1:80,000 epinephrine; Lignospan; Septodont, Saint Maur des Fosses, France) with infiltration technique, coronal fragment was gently removed and pulp tissue was extripated. It was found that the fracture line has been extended apically to alveolar crest on the distolingual side. The root end was mature, and apex was closed. Tooth was restored with intermediate restoration material (IRM) (Dentsply De Trey, Konstanz, Germany) dressing. It was decided to treat the patient with intentional replantation with rotation and slight extrusion to establish good access to the fracture line in all sides of the tooth. The PDL was incised using a surgical blade and the root luxated with a narrow periotum. The tooth was extracted gently with an anterior tooth forceps and was inspected for additional fractures. Then, it was rotated 180° to achieve optimal position and replanted in its socket subsequently. Average extraoral time was 4 minutes. Then, it was splinted with a orthodontic semi-rigid with 1 mm thick wire (Haekwang, Bucheon, Korea) and flowable composite resin (MetafilFlo; Sun Medical, Shiga, Japan). Incisal edge was trimmed to remove biting force on the affected tooth. IRM was applied to close the access cavity. Oral hygiene was explained to the patient, and he was advised to eat a soft diet and avoid biting on the injured tooth. Amoxicillin (500 mg) and 0.2% chlorhexidine mouthwash were prescribed. After 1 month tooth was prepared for composite resin restoration. First the tooth was trimmed to shape new buccal and lingual surfaces, then 2 mm of gutta-percha was extracted with a heated plugger to achieve intracanal retention and then it was restored with composite resin (3M ESPE, St. Paul, MN, USA) [[Figure 2]B]. Follow-up sessions were scheduled for 1 month, 6 months, and 18 months after treatment. Clinical and radiographic evaluation showed acceptable results in mobility test, probing depth, and clinical attachment level in all follow-up sessions. No evidence of root resorptions or ankyloses was found. [Figure 3] shows follow-up radiographic evaluation. In this case, intentional replantation was found to be the best treatment option. Orthodontic extrusion of apical fragment is very expensive and time consuming and was not a suitable treatment for this patient with low economic status who was from a city 240 kilometers away from the referred dental office. Orthodontic extrusion can also lead to undesirable gingival overgrowth. It should be mentioned that this treatment is not the first choice, but because of our limitation, this treatment was selected. Late complications that compromise healing include external root resorption and enlargement of periapical radiolucencies and ankyloses. In fractures that extended apically to alveolar crest, surgical extrusion combined with rotation of the root 180°, less extrusion is needed favoring the bone support of the root and with this rotation, operator can assess fracture meticulously. Surgical crown lengthening was not considered in this case because it does not meet the esthetic needs in anterior teeth and could cause resorption of the labial cortical plate which interfere with placing dental implants in conditions where tooth extraction is required. This treatment method was reported to be successful by Kahnberg after 5 years of follow-up. Chung et al. reported a case of crown-root fracture treated with intra-alveolar transplantation with 180° rotation and suture fixation, which was a successful treatment after 1 year follow-up. Bender recommended this procedure for teeth with anatomical limitations and difficult accessibility. Different analysis of this tooth, as described above, revealed that intentional replantation is the best treatment option. Clinical and radiographic assessments were normal after 18 months of follow-up. Intentional replantation technique is a promising method to treat fractured teeth with poor prognosis. Careful planning is important for the success of replanted tooth. Kim DS, Shin DR, Choi GW, Park SH, Lee JW, Kim SY. 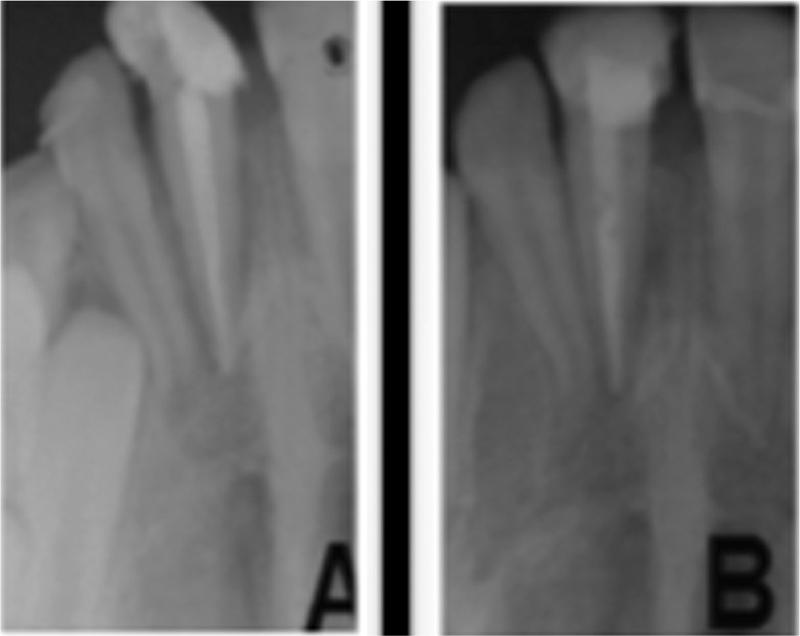 Management of complicated crown-root fractures using intentional replantation: Two case reports. Dent Traumatol 2013;29:334-7. Andreason JO, Andreason FM, Andreason L, editors. Textbook and color atlas of traumatic injuries to the teeth. John Wiley & Sons; 2013. Chung MP, Wang SS, Chen CP, Shieh YS. Management of crown-root fracture tooth by intra-alveolar transplantation with 180-degree rotation and suture fixation. Oral Surg Oral Med Oral Pathol Oral Radiol Endod 2010;109:126-30. Sahebi S, Dolatkhah V, Shojaee NS. Management of a crown-root fracture in central incisors with 180° rotation: A case report. Iranian Endod J 2011;6:183-7. Shanmugam J, Mahendran K, Mandhiradoss R. Management of complicated Crown root fractured teeth by intra alveolar transplantation with 180° rotation: Case series. SRM J Dent Sci 2014;5:203-6. Bender IB, Rossman LE. Intentional replantation of endodontically treated teeth. Oral Surg Oral Med Oral Pathol 1993;76:623-30. Torabinejad M, Dinsbach NA, Turman M, Handysides R, Bahjri K, White SN. Survival of intentionally replanted teeth and implant-supported single crowns: A systematic review. J Endod 2015;41:992-8. Khayat A, Fatehi S. Clinical evaluation of forceps eruption: Reestablishing biologic width and restoring no restorable teeth. Iran Endod J 2006;1:1-5. Cho SY, Lee Y, Shin SJ, Kim E, Jung IY, Friedman S et al. Retention and healing outcomes after intentional replantation. J Endod 2016;42:909-15. Kahnberg KE. Intraalveolar transplantation of teeth with crown-root fractures. J Oral Maxillofac Surg 1985;43:38-42.